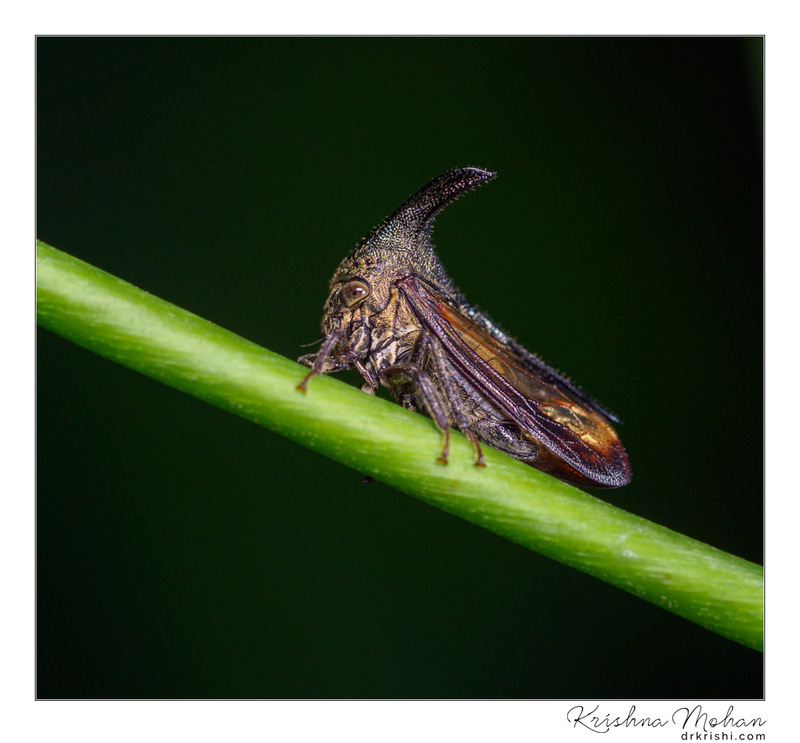 This curious insect belongs to the group of treehoppers from family Membracidae. 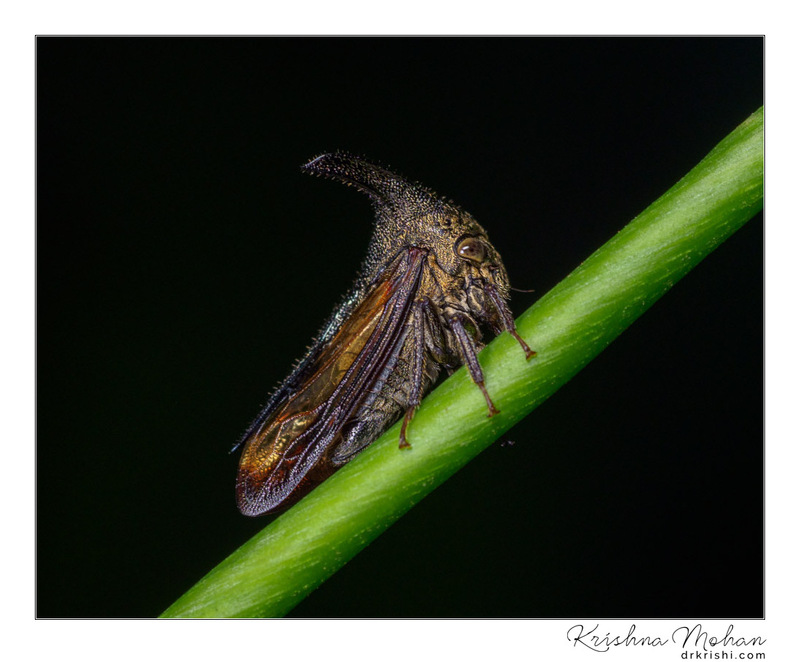 It is also called Thorn Mimic Treehopper as it looks like a thorn. 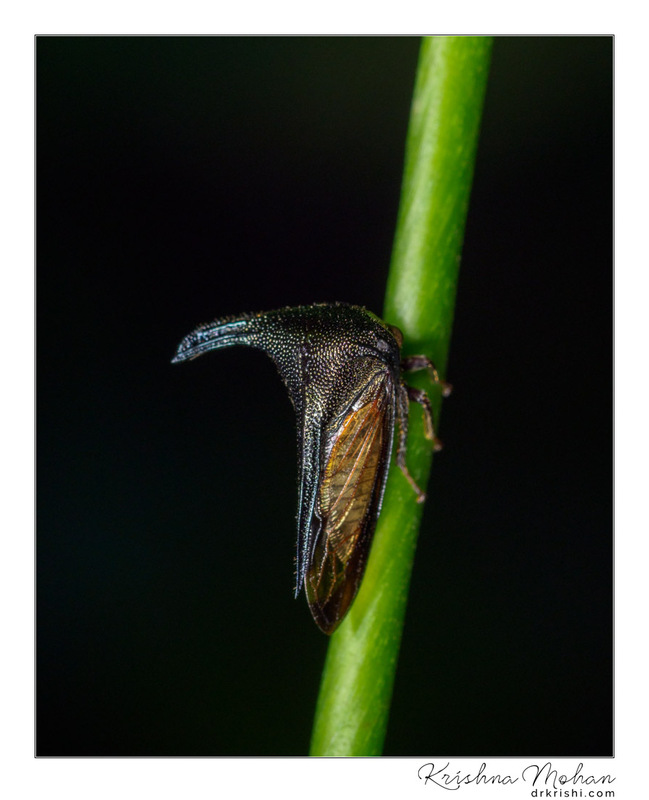 I found this treehopper on a Smooth rattlepod, Crotalaria pallida plant. 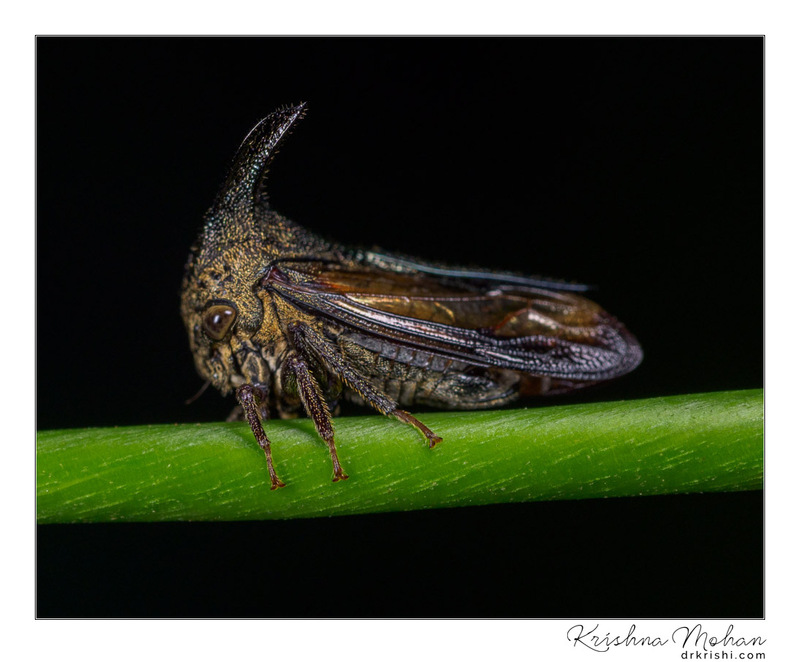 Photographed using Olympus OMD EM1 mark II with Olympus M.Zuiko Digital ED 60mm f/2.8 Macro Lens using Olympus STF-8 Twin Flash. 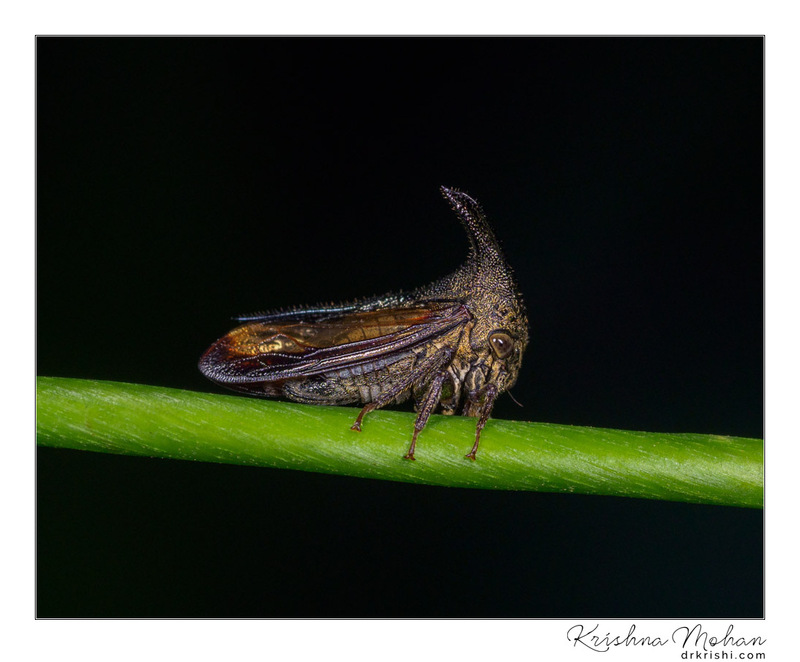 The family Membracidae commonly known as Treehoppers comprises of a distinct group of small phytophagous insects belonging to Auchenorrhynchous Homoptera occurring in all the major geographic regions, their diversity and abundance reaching a peak in the tropical and sub-tropical areas. 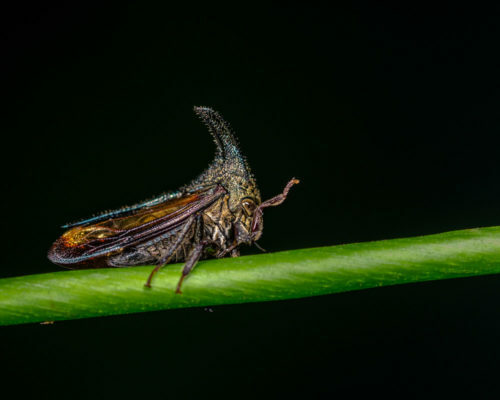 These homopteran bugs are easily recognized by the structure of pronotum which takes curious bizarre shapes in different species that have earned the name Cow bugs or Horn bugs. 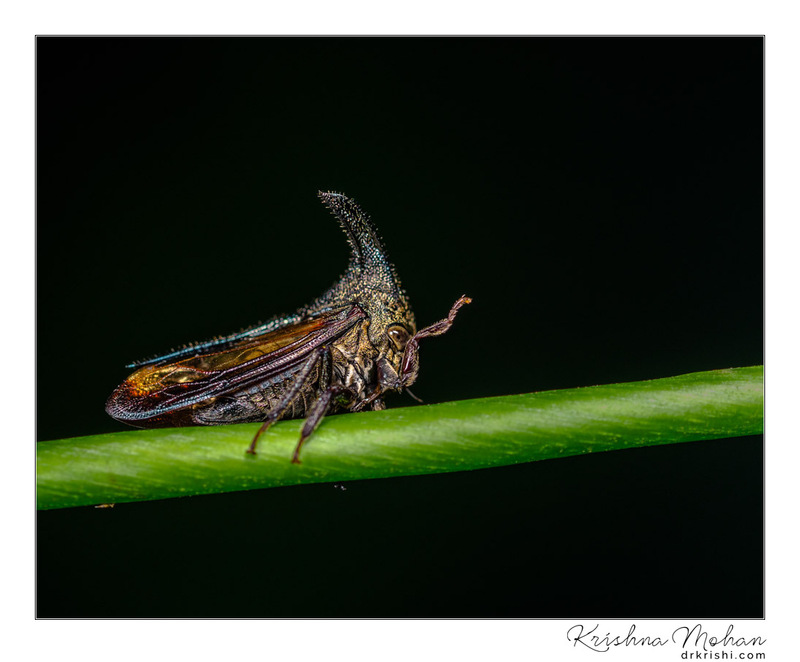 The pronotum of these bugs is extended back over the abdomen and ornamented with various spines, horns, keels and bell-like knobs etc., of different shapes. They are unique in having a pair of mesopleural processes. The wings are large and concealed by pronotum. 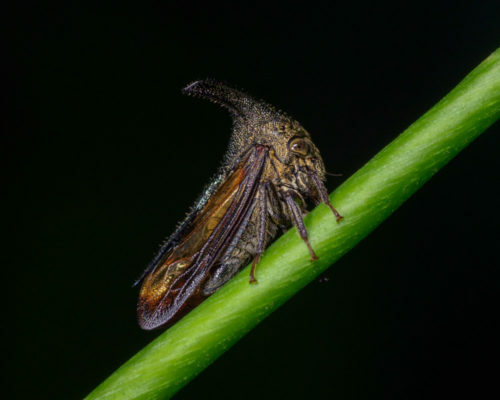 Although endowed with powers of flight, they prefer to hop about when disturbed and this habit has earned them the popular name Treehoppers. 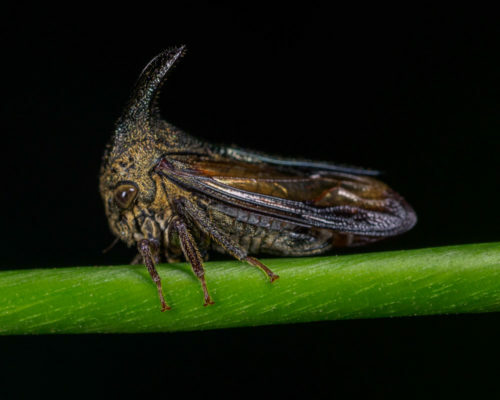 These bugs feed by sucking the sap of trees, shrubs and cultivated crops and most species are host specific. Even though they are not destructive to the extent of assuming pest status, the principal damage or injury caused to host plants is either by feeding or egg laying. Adults of many species of membracids which are relatively more active, jump or flyaway in response to a quick-moving object across them, but are not stimulated by slow-moving objects; this behaviour of the bugs is taken advantage of in collecting them by slowly moving the fingers behind the insect and catching them with a sudden jerk of the fingers. In general, membracids are sun-loving. Species of Leptocentrus are noticed to move to the terminal parts of the branches so as to expose themselves to light and they appear to be more active during the warmer part of the day. 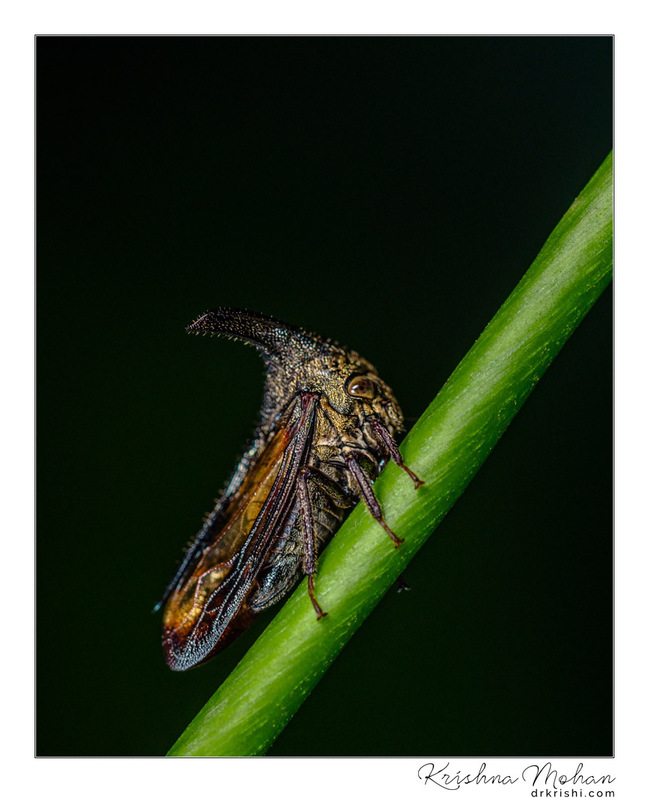 Although equipped with normal wings, membracids are not known for long and sustained flight. Of the three modes of locomotion, namely, walking, jumping and flying, the first one is most frequently adopted. 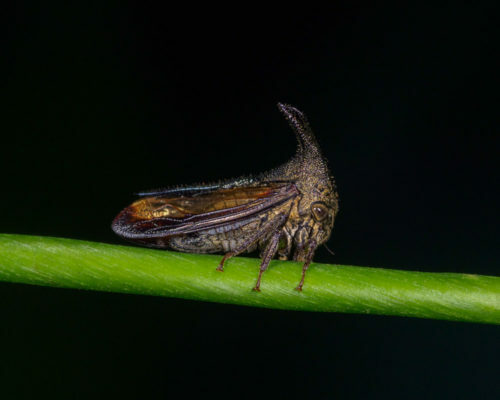 The nymphs, unlike the adults, are always cryptic; they are usually dorso-ventrally compressed and they remain adpressed to the host plant with their colour blending with that of their background. They are sluggish and not noted for swift locomotion. The feeding behaviour of membracids is similar in all essential respects to that of other plant bugs. As a rule, plants that are hairy are avoided. Both nymphs and adults are phloem feeders, and the process is rather slow, leisurely and prolonged. The rostrum is so deeply anchored in the host plant tissue that it becomes broken if the insect is forcefully pulled out. The feeding sites on the host plant are often specific. Membracids exhibit host specificity to a remarkable degree. Certain species of plants, although occurring in abundance, are free from membracids. In southern India, for instance, plants belonging to the families Cucurbitaceae, Oleaceae, Asclepiadaceae, Apocynaceae, Meliaceae and Labiatae are avoided by the membracids, while plants belonging to the Fabaceae, Mimoseae and Caesalpiniaceae harbour membracids. Mating occurs throughout the year in most of the species on the plants, and several generations may be completed in those species without prolonged life-cycles. On the other hand, species found at high altitudes do not mate throughout the year and they are highly seasonal with the consequence that only two or three generations are completed in a year. The number of eggs in each egg mass varies even within the species. The incubation period of eggs differs from a minimum of 5 and a maximum of 16 days. 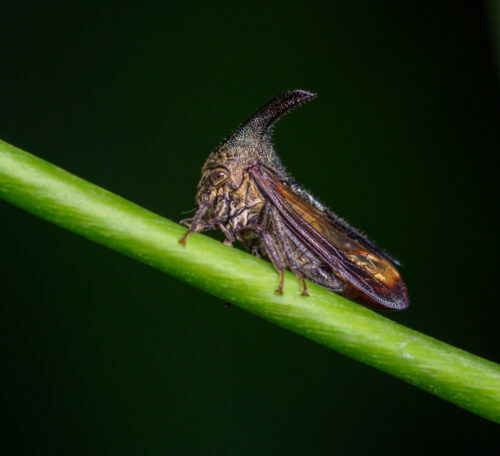 These tree hoppers secrete a sugary substance called ‘honeydew’ which serves as food for ants, bees and wasps. 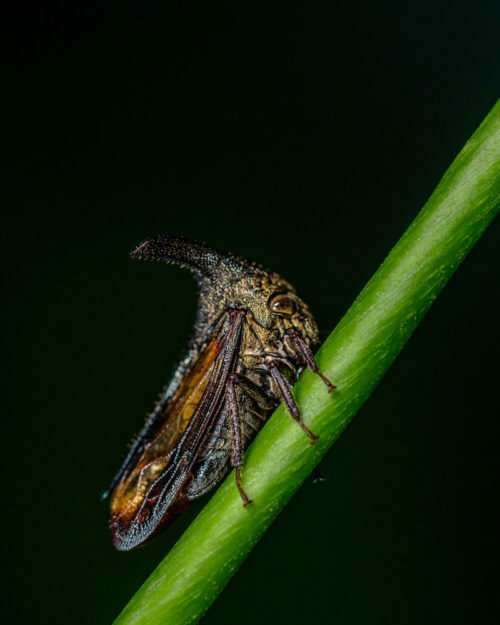 In turn, this group of bugs frequently benefit from the interaction with ants that provide house cleaning services and often protect the hoppers from predators in exchange for the honeydew. 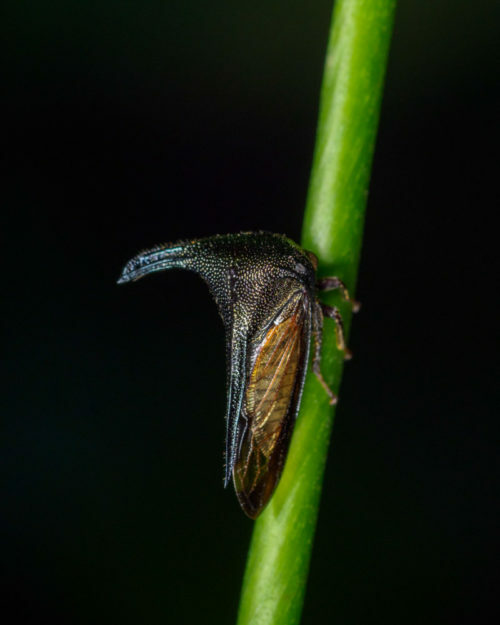 These phytophagous bugs are solitary, gregarious or subsocial and some species guard their eggs and immature. EXIF info - Aperture : ƒ/4 | Camera : E-M1MarkII | Taken : 3 June, 2018 | Flash fired : yes | Focal length : 60mm | ISO : 200 | Location : 13° 4.0311′ 0″ N 74° 59.7279′ 0″ E | Shutter speed : 1/80s | Images and content Copyright © Krishna Mohan. Please contact me to purchase prints or for image publication license. EXIF info - Aperture : ƒ/6.3 | Camera : E-M1MarkII | Taken : 3 June, 2018 | Flash fired : yes | Focal length : 60mm | ISO : 200 | Location : 13° 4.0311′ 0″ N 74° 59.7279′ 0″ E | Shutter speed : 1/80s | Images and content Copyright © Krishna Mohan. Please contact me to purchase prints or for image publication license.